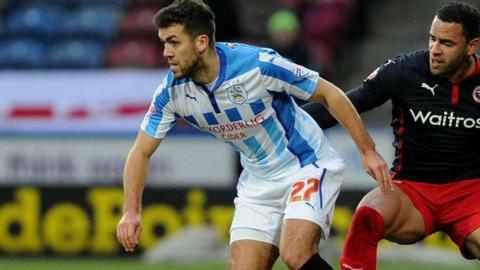 Huddersfield Town defender Tommy Smith says he panicked after regaining consciousness in a helicopter on the way to hospital after being knocked out during Saturday's 2-1 defeat by Leeds. The 22-year-old needed nine minutes of treatment on the pitch after colliding with goalkeeper Joe Murphy. He is now back in training after being discharged from hospital on Sunday. "It took me by surprise, and when I realised where I was I started panicking a little bit," Smith said. "I was all strapped up to keep me secure and the panic came about because I couldn't really move. "I remember thinking to myself just to try and keep calm, to close my eyes and hopefully the whole experience will be over in no time," he told the Huddersfield Examiner. "Up until then the whole thing just seems like a complete blur." The former Manchester City trainee has made 27 appearances for the Terriers this season. He was taken to hospital by the Yorkshire Air Ambulance, a charity that Town have had links with for a number of years. "I obviously knew of the air ambulance before Saturday because of the club's work, but for me to actually have to use it - it makes you realise what a fantastic service it is to have," he added. Has Harry Redknapp lost his sparkle? Read more on Harry Redknapp: Has former QPR boss lost his sparkle?